Our printed banners have hemmed edges and grommets for quality and strength. 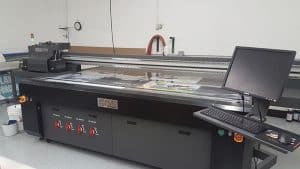 Our custom banner printing equipment is capable of printing 72″ by 150″ and any banner size in between! We can digitally print, full color, with our 60″ StratoJet Hawk EcoClean (using ecosolvent inks). 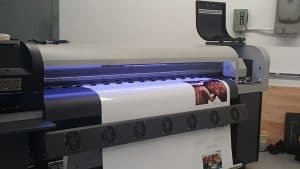 This printing process allows us to print banners, signs, and canvas, producing vibrant, high resolution prints that last for years. Our StratoJet Shark will digitally print on a variety of rigid and flexible substrates. This reduces the need for adhesive vinyl on yard signs, corragated plastic signs, metal signs, etc. The flat bed also aids in printing our plastic for plastic embossed signage. This printer gives us capabilities to directly print on a wide variety of materials. Call for more information!